It’s been exactly one year since their last show at Phog…so look out! In a town with no particular music scene beyond a handful of pop-punk and metal bands, The Mark Inside unified through a desire to be a sore thumb amidst suburban inspired blandness. They were music fans first and foremost and still believed in the power of distorted guitars, drums and volume. Anyone could play loud, and most adolescent bands around the boys were playing at excruciating decibel levels, but very few made it anything but boring and painful. The Mark Inside began playing to amuse only themselves in rehearsal and having grown up on many of the same records as one another, they naturally drifted into sprawling, aggressive blues jams, winding chaotic climaxes, feedback squalls, lush melodies and thick rhythms which they tried to structure and turn into songs. Amalgamating their favourite elements of the British Invasion, late sixties psych-rock, a surprising contingent of Canadian independents, and punk rock to create a jarring modern rock sound that defies convention, The Mark Inside taunts genre-classification and demands attention. While most teenagers were planning out their college or university destinations, The Mark Inside were planning out their musical careers. 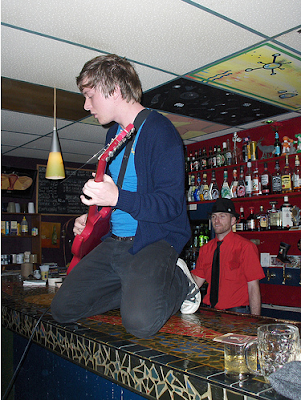 Now, years later, they’re signed to the biggest indie label in Canada and are lauded by critics and music lovers alike. They’ve released a full-length album, shot a music video for their first single and have perfected a live show that decimates audiences nightly.